Marketplaces and prices shown matched UPC number 026676677919 during our search. 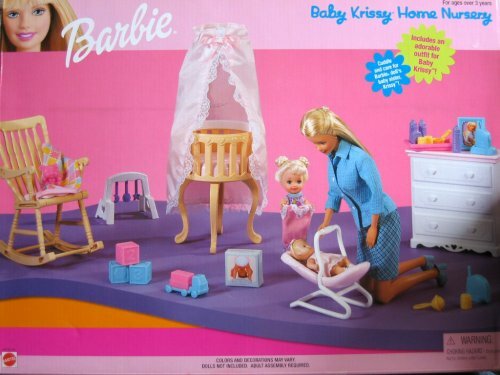 Barbie Baby Krissy Home Nursery is a 1999 Arcotoys, Mattel production. Box approx. 17" x 12-3/4" x 2.5". Includes: Crib with Hanging Cloth, Drawer Unit, Rocking Chair, Baby Carrier, Baby Activity Toy Unit, Baby Outfit, Quilt, Box of Diapers, Baby Monitors, Food Tray, Milk Bottles, Pretend Baby Food, Blocks, Truck, Teddy Bear, Photo Frame, Rattle, Medicine Bottle, Bowl & Spoon. Set includes an Adorable Outfit For Baby Krissy! ADULT ASSEMBLY REQUIRED. Sizes, colors & details approximate & may vary. 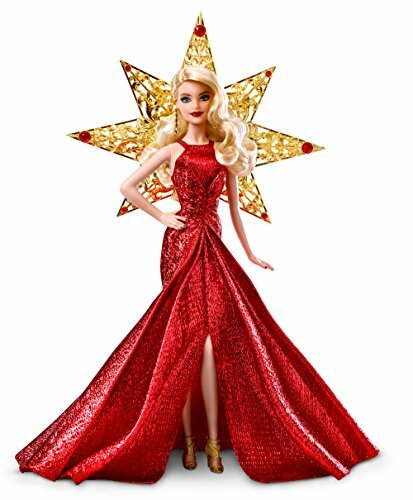 All included items are pretend & intended for Barbie , Krissy , Kelly & other 2-3/4" to 11.5" tall fashion size dolls; NO DOLLS included. Playset can be used with other size dolls, as preferred. For Box Condition see CONDITION NOTE or Email Seller for Details. Box has shelf wear, back top corner crunch, & sticker removal damage at top. Barbie Baby Krissy Home Nursery is a 1999 Arcotoys, A Mattel Company production. Model #67791-91. Box is approx. 17" x 12-1/2" x 2-1/2". Playset includes an adorable Outfit for Baby Krissy Doll! Playset Includes: Crib with Hanging Cloth, Drawer Unit, Rocking Chair, Baby Carrier, Baby Activity Toy Unit, Baby Outfit, Quilt, Box of Diapers, Baby Monitors, Food Tray, Milk Bottles, Pretend Baby Food, Blocks, Truck, Teddy Bear, Photo Frame, Rattle, Medicine Bottle, Bowl and Spoon. All items are pretend & intended for Barbie (11.5" tall), Krissy (2.75" tall), Kelly (4.5" tall) & other 2-3/4" to 11.5" tall fashion size dolls; NO DOLLS are Included. Playset can be used with other size dolls, as preferred. Colors & decorations may vary from those shown on box. ADULT ASSEMBLY REQUIRED. Playset for ages 3+ years. All the provided details are to the best of my ability & may not be exact; colors, styles, sizes & details may vary. Barbie Baby Krissy Home Nursery, a 1999 Arcotoys, Mattel production, is great for any collection, as a gift or just for fun play! For Box Condition see CONDITION NOTE or Email Seller for Details. *Box has shelf wear & rubbing at some corners/edges, & back top corner is crunched; sticker removal damage on front near top.